When you realize your marriage is over, it can feel paralyzing. How do you tell the one you once loved and promised to spend your life with, “It’s over”? How you prepare for what could easily be one of the most difficult conversations of your life will set the stage for how everything unfolds from this moment forward. None of this is easy or ever feels comfortable, but this call will help support you with one of the most difficult conversations you may ever have. When a marriage is ending, it doesn’t have to be filled with hate and venom. Although admittedly it might be easier to walk away in hate, the more powerful and peaceful thing is to attempt to walk away in love and compassion (if not for him, at least for you). How to set the stage for peace so you don’t create a hurtful and uphill battle for many months or even years. What you will say in this first of many conversations. How to not allow fear to guide your actions or your words. 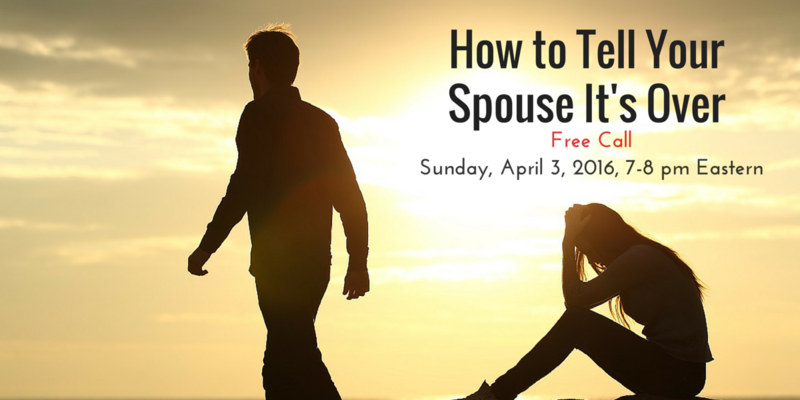 Don’t miss the “How To Tell Your Spouse It’s Over” free call. Just send your name and email and you’ll receive a message with all the details of how to join me for this soulful guidance. Space on the call is limited, so be sure to reserve your spot today. How Do You Have The "It's Over" Conversation? This free call will help you share your decision with your spouse in a way that sets the stage for peace; peace for you and your heart. I will share valuable tools, insights and language that you need to have this difficult conversation.